The dresses, the tuxes, these are all relatively easy to choose. 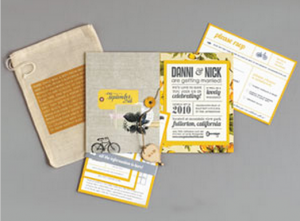 Your wedding invitations and what to say are a little more difficult. Once you’ve the invitations are perfectly worded and printed you’ll be more than eager to send them away. But hold on there eager beaver, you don’t want to send them off too soon! There is etiquette that dictates when you should send out those cards. It all depends on your guests proximity to your wedding. If you’re having a local wedding with all local guests, then you send the invitations 6-8 weeks before hand and ask on the RSVP cards for a response at least 2-3 weeks before the wedding date. This will give you time to get your final numbers into the caterer and begin the fun task of assigning seats to your guests. If you are having guests from out of town, you should send the invitations 10-12 weeks in advance. If you’re inviting international guests definitely send them out at 12 weeks as international mail can take up to 2 weeks to reach its final destination, sometimes even longer. On these reply cards you might want your guests to call you directly with an answer and not risk the reply getting lost in the mail. That being said, after you’ve sent out your international invitations, you might want to call or email those guests to inquire whether your letter reached them safely. If you are planning a destination wedding, the same rule applies for international invitations. Send them out 10-12 weeks before the actual wedding. This will allow guests to take time off work, book hotels and make travel arrangements. Now that you’ve been given the 411 on invitations go out and get those stamps because your getting married! !